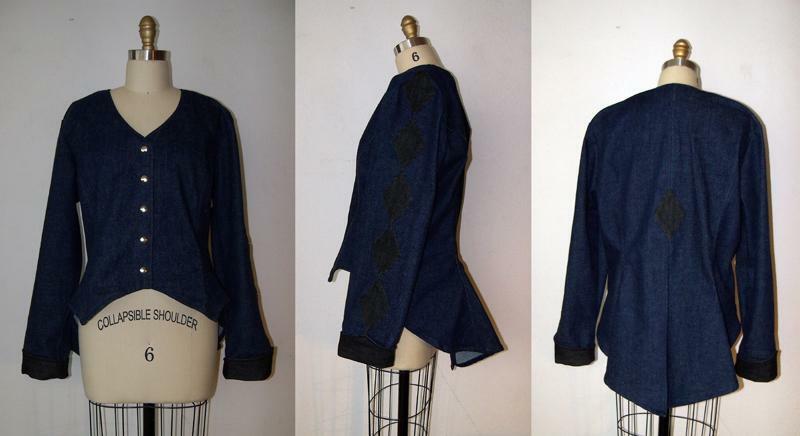 The outer fabric is 100% blue cotton denim. The facings, cuffs, and contrasting diamonds are 100% black cotton denim. As always with my coats, machine wash cold, line dry. Bust under the arms: 46". From the centerback neck to the bottom of the tail measures 30 1/2". If this coat had a center front base of neck (notice "v" neck instead?) to hem it would measure about 18". The points on either side are a little longer. Shoulder to Shoulder is 18 1/2". Sleeves are approx. 26" long uncuffed (remember that they are made to cuff). You can wear it either way depending on your arm length..